DocTools CrossReferenceManager makes it easier than ever to work with cross-references in Word. The add-in includes smart and efficient cross-reference tools for Microsoft Word that you do not find elsewhere. The add-in works with Word 2007, Word 2010, Word 2013, Word 2016, Word 2019, Word for Office 365 on PC. DocTools CrossReferenceManager is the perfect, time-saving tool for you if you use Microsoft Word for writing documents in which you need to create a lot of cross-references. Examples of such documents are contracts, scientific reports, technical reports, technical specifications, user manuals and academic dissertations. Watch the short video below and read on to learn how DocTools CrossReferenceManager can help you. DocTools CrossReferenceManager is a terrific add-in that adds functionality to Microsoft’s own cross-referencing function, and makes it much easier to assign cross-references. A great tool for all power Word users. Custom cross-reference texts – This is COOL!!! ​I love the filter function! ​I love how after you've inserted a cross-reference, all your settings – AND the last cross-reference you chose – display when you go to insert a new one (this is super handy when you’re assigning numbered cross-references for bibliographic citations)! I use almost no add-ins as often trying to remember them all is more work than it is worth. But your tool, DocTools CrossReferenceManager, is a winner and I have put the icon on the quick launch tool bar and use it almost every day as I write my reports. I have been using DocTools CrossReferenceManager for several months and have found it to be extremely useful. I am also extremely pleased and impressed by Lene Fredborg's support. When I ran into issues using the program, Lene Fredborg helped me solve the issues quickly and professionally. I could not ask for more from any software provider. I highly recommend CrossReferenceManager as a fantastic group of tools, saving time and making my documents more accurate and accessible. Lene gives amazing support! She gives clear, detailed and understandable instructions. She is really committed to her user's success, creating updates and tweaking features at amazing speed. I bought CrossReferenceManager a few months ago and it's been a godsend as I prepare my PhD thesis for submission in July. CrossReferenceManager is making a substantial contribution to my thesis by allowing me to produce detailed referencing that allows my supervisors (and later examiners) to follow my arguments better. Cross-references in Word documents are used to refer to related content elsewhere in the same document. Word has built-in functionality that lets you create cross-references to different types of targets. 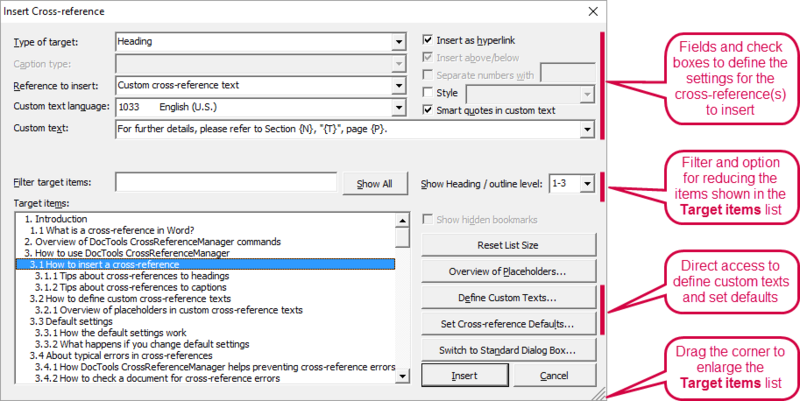 DocTools CrossReferenceManager lets you do everything you can do with cross-references in Word using the built-in cross-reference functionality - but you can do it easier and faster. In addition, DocTools CrossReferenceManager includes smart and efficient cross-reference features that are not found elsewhere. The user interface (i.e. screen texts in the Ribbon, dialog boxes, help, etc.) 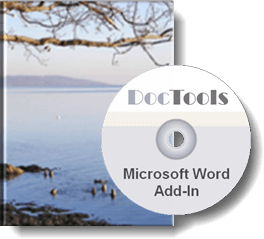 of DocTools CrossReferenceManager is in English but the add-in can be used with any language version of Word. DocTools CrossReferenceManager is easy to use. You can start using it immediately but it is recommended to spend time on familiarizing with the functionality in order to take full advantage of all the features. A cross-reference in Word is a field, i.e. set of codes that instructs Word to automatically insert material into a document - click here if you want to learn more about how cross-reference fields work. Once you have inserted cross-references in a document using DocTools CrossReferenceManager, those cross-references will work precisely as if they had been inserted using Word's built-in functionality. This means that users who don't have DocTools CrossReferenceManager installed can work with your documents as they would normally do. 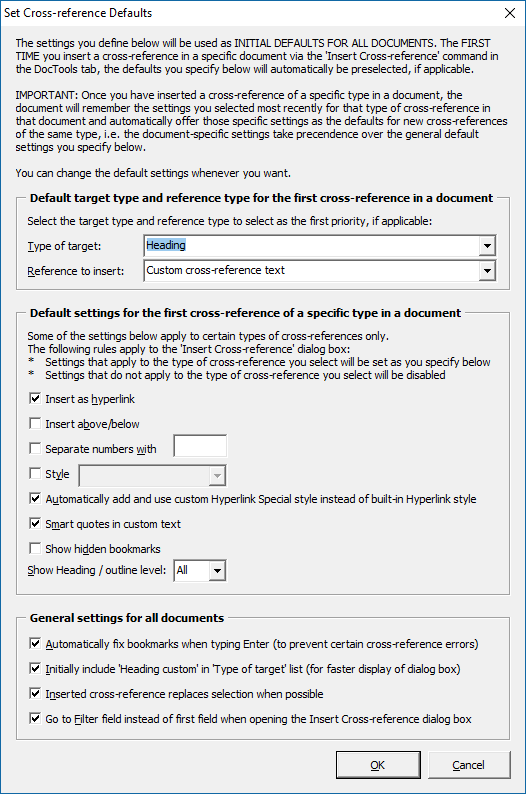 Below is a short description of some of the special features that are included in DocTools CrossReferenceManager to make your work with cross-references in Word more efficient. You will find more details below this introduction. Also, take a look at the Cross-reference Tools menu that is illustrated on the right and you will get an idea of the amount of features. The Insert Cross-reference dialog box lets you filter target items. This is a real time saver. You can quickly reduce the list of target items to precisely the one you need. You can now set the the Filter field as the default field for even faster selection. You can filter target items to show all Heading / outline levels or only level 1, 1-2, 1-3, or 1-4. 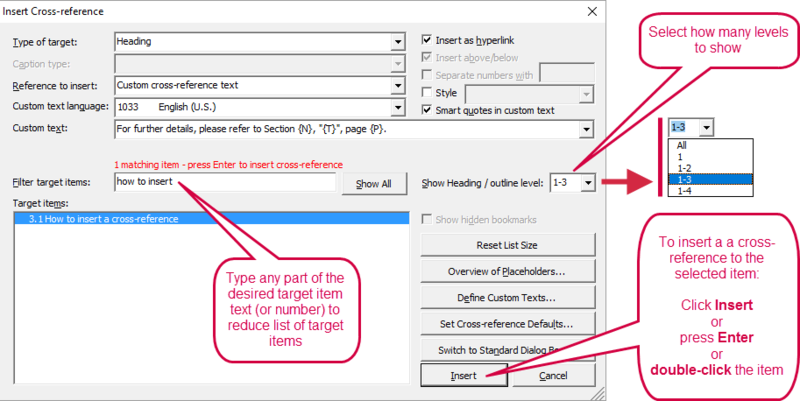 In addition to the cross-reference target items supported by the built-in cross-reference functionality, you can easily insert cross-references to headings that have not had one of the Heading 1-9 styles applied to them. Any paragraph that has been applied outline level 1-9 either via another style or as direct formatting will automatically be listed as a target item. This means that you do not need to manually add a bookmark to such heading in order to cross-reference it. You can insert cross-references to only the caption number of a caption (without the label). This makes it easy to create cross-references like e.g. "See Figures 12 to 15" where the last item shows the number only. You can automatically apply a character style to cross-references you insert. A command also lets you apply a character style to all cross-reference fields in the entire document in one operation – a fast and easy way to make sure the formatting is consistent. Or you can reset the formatting of all cross-reference fields if you change your mind. The Check and Repair Cross-references command checks the document for errors in cross-reference bookmarks and cross-reference fields and provides tools for repairing any errors found. In addition, the add-in includes functionality that can prevent certain types of errors such as cross-references pointing to number 0 (zero). You can define default settings that will be used as the initial settings in all documents the first time you insert a cross-reference. The Insert Cross-reference dialog box will then open with those settings already selected. You can change the default settings whenever you wish. Once you have inserted a cross-reference in a specific document, the document will remember your latest cross-reference settings used in that document the next time you open the dialog box. Furthermore, the document will remember the different settings you made for each type of cross-reference. Even the target item you selected will be remembered so it is easy to insert more cross-references to the same target item. You can resize the Insert Cross-reference dialog box so you can see more target items and longer target items. The dialog box will remember both its size and position – even between Word sessions. The Cross-references Tools menu gives you access to a lot of functionality. You will find a short description of all commands in the More details section below. You will find more details about the cross-reference features below. See also the comparison of features in DocTools CrossReferenceManager and Word's built-in cross-reference features at the end of this page. What is a cross-reference in Word? Several years ago I developed some special cross-reference tools to be used with documents based on a customer-specific set of Word templates. The tools were included in a customer-specific add-in. The tools saved a lot of time for the users and helped secure consistency across documents. Since 2007, I have provided help on cross-reference problems to anyone via a Word Tips article on my website www.thedoctools.com . The article includes a set of videos that illustrate some of the problems that can occur in relation to cross-references and how to solve and prevent them. From the number of visitors to that article and the videos and the feedback I have received, I know that cross-references in Word cause problems to many users and cost a lot of time. The idea of developing an advanced cross-reference add-in that could make the work with cross-references in Word easier and smarter and that could be used with any Word document in any language was born years ago. But I also realized that it would be quite difficult to make an add-in that could do all the things I wanted and that the development would require a lot of time. In the spring 2016 the add-in was ready, DocTools CrossReferenceManager. Version 2.0 was the first version available from this website. A cross-reference in Word is a field, i.e. set of codes that instructs Word to automatically insert material into a document. The material inserted by cross-reference fields can be text, section numbers, paragraph numbers, caption numbers, caption labels, etc. The field code can also include special information (referred to as switches) that make the field act or look in a special way, e.g. the field may function as a hyperlink. There are three types of cross-reference fields in Word: REF, PAGEREF and NOTEREF. Want to learn more about how cross-reference fields work? 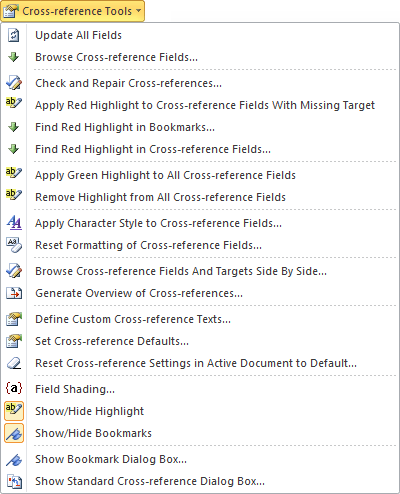 You will also find more details about how cross-references work in the help built into DocTools CrossReferenceManager. The user interface of DocTools CrossReferenceManager is in English but the add-in can be used with any language version of Word. TIP: ​You can add any of the commands to the Quick Access Toolbar (QAT) if you want. To do this, right-click the desired command and click Add to Quick Access Toolbar. You will find a short description of each command in Overview of the Cross-reference tool menu commands below. 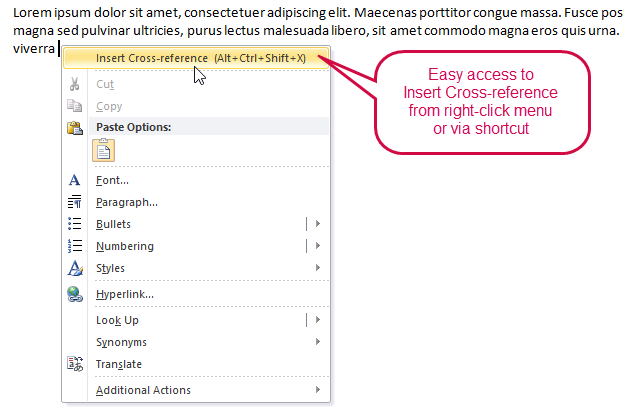 All you need to do to insert a cross-reference is to position the insertion point where you want the cross-reference and select Insert Cross-reference. The first time you select this command, you will be asked to fill in the Set Cross-reference Defaults dialog box so the Insert Cross-reference dialog box can open with the defaults you want. Note that the straight quotes in the selected custom text have been automatically converted to smart quotes because the Smart quotes in custom text option was turned on. Via the Set Cross-reference Defaults dialog box, you can define the settings you want as the initial defaults for all documents. Those settings will automatically be preselected the first time you insert a cross-reference via the Insert Cross-reference command in a specific document, if applicable. In addition, the General settings group in the dialog box lets you apply other settings that are helpful. You will find details about how it works in the dialog box itself and in Help in CrossReferenceManager. As also explained in the dialog box, once you have inserted a cross-reference of a specific type in a document, the document will remember the settings you selected most recently for that type of cross-reference in that document and automatically offer those specific settings as the defaults for new cross-references of the same type. The Set Cross-reference Defaults dialog box. You can save language-specific custom texts for headings and for captions. You can save up to 200 custom texts for each type and for each language – that is most likely more than you would ever need. The custom cross-reference texts you define are stored in a configuration file locally on your computer. If more users need the same custom cross-reference texts, you can replace the configuration file on one computer with a copy of the file that includes the custom cross-reference texts that were set up on another computer. This way, you can make sure that a whole group of users can easily use cross-references consistently both within and across documents. The illustrations below show the dialog boxes for adding/editing customs texts for headings and captions, respectively. The placeholders you can insert differ but except from that, the dialog boxes work the same way. You open the dialog boxes illustrated below via the Define Custom Cross-reference Texts command. The initial dialog box that opens will list all currently defined custom texts for the language you select. It also lets you delete and rearrange the custom texts (that dialog box is not illustrated here). A progress bar will be shown when you perform operations that may take more than a few seconds. You can see an illustration of the Cross-reference Tools menu close to the top of this page. Updates all fields, i.e. fields of any type, in the entire document including headers, footers, etc. However, locked fields, if any, will not be updated. Lets you select the cross-reference fields in the active document one by one, starting from the cursor position if the selection is in the main text story. A dialog displays the field code of the selected field. Lets you check the entire document for problems with and inconsistencies between cross-reference bookmarks and cross-reference fields and lets you correct the errors, if any. Possible problems will be found one by one in order for you to handle them individually. The command also lets you mark a possible error with red highlight for later check. Checks all cross-reference fields in the document and applies red highlight to fields with missing target, i.e. fields that refer to bookmarks that do not exist. Lets you check the entire document for bookmarks with red highlight. It will stop at each occurrence, if any, and let you remove the highlight or stop to fix a problem manually. Red highlight may be applied during check of cross-references to mark cross-reference bookmarks with possible problems. Lets you check the entire document for cross-reference fields with red highlight. The command will start from the cursor position if the selection is in the main text story. It will stop at each occurrence, if any, and let you remove the highlight or stop to fix a problem manually. Red highlight may be applied during check of cross-references to mark cross-reference fields with possible problems. Red highlight may also be applied to all cross-reference fields with missing target using the command above. Applies green highlight to all cross-reference fields, i.e. fields of the types REF, PAGEREF and NOTEREF. The cross-reference fields will be updated. Unlocked fields will be applied bright green highlight.Locked fields will be applied dark green highlight. Removes highlight from all cross-reference fields (locked and unlocked), i.e. fields of the types REF, PAGEREF and NOTEREF. The cross-reference fields will be updated. This command lets you apply character formatting to all cross-reference fields in the main text story or in the entire document. You can select from all character styles and linked styles currently found in the document. NOTE: Any existing character formatting will be removed from the cross-reference fields. Any changed field will be updated unless the field is locked and thereby prevented from updating. This command lets you remove character formatting from all cross-reference fields in the main text story or in the entire document. The command removes the CHARFORMAT and MERGEFORMAT switches from the field code, if found. Any direct formatting will be cleared. Any changed field will be updated unless the field is locked and thereby prevented from updating. Displays the active document in two windows side by side. A dialog box lets you step through cross-reference fields one by one. The found field will be marked by blue highlight in the window to the left and the related target, if any, will be selected in the window to the right. Information related to the field and target will be shown. Creates a new document including information about all cross-references in the active document. For each cross-reference, the report will include misc. information about the location and content of both the field and the target. Lets you add, edit, delete and organize language-specific, custom cross-reference texts. A custom text can e.g. be a whole sentence including several cross-reference placeholders. A custom text can be inserted into any document with a single click. The placeholders will automatically be replaced by cross-reference fields to the selected target. See also the dialog boxes and examples illustrated ﻿﻿﻿above. Lets you define default values that will be used the first time you insert a cross-reference in a document via the Insert Cross-reference command in the DocTools tab. This command resets all cross-reference settings in the active document to the default settings. This will not change any cross-references in the document but only influence the settings initially shown in the Insert Cross-reference dialog box. Lets you select how fields are displayed on the screen. It is recommended to have field shading shown always. Turns the display of highlight on or off. If the option has been turned off, highlight colors will not be displayed in documents. The highlight, if any, will still be present and will reappear if you turn on the setting again. ( _ ), are never displayed. Opens the built-in Bookmark dialog box. Opens the built-in Cross-reference dialog box. That dialog box will not be influenced by the DocTools CrossReferenceManager functionality. See also the comparison of features in DocTools CrossReferenceManager and Word's built-in cross-reference features below.